Local favorites OBN IIIs are coming through on a proper tour this summer. In mid-July these guys will kick off their tour at Bryan Street Tavern. OBN III’s started as a threat. In January 2010 that threat became a reality when they played their first of many shows at Beerland in Austin, TX. Orville Bateman Neeley III, the band’s singer and namesake, teamed up with Matt Hammer on drums, Jason Smith and Andrew Cashen on guitars and Graham Low on bass at the very end of 2009. With the intention of filling a spot on the show calendar this new band came together in two weeks with a 30 minute set of material. Success! 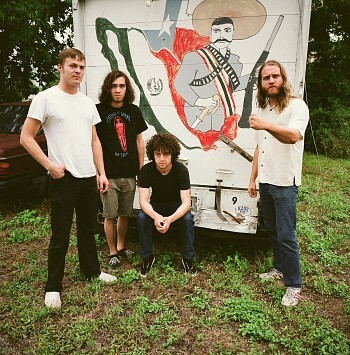 Before long OBN III’s were playing every week in Austin, or so it seemed. Summer 2010 brought their first attempts at recording themselves aside from recording shows off the venue’s mixing board. Three people took interest (in releasing said material). Early the following year (2011) three 7” records were released, one on Super Secret Records of Austin and two on Tic Tac Totally of Chicago. During SXSW in March of 2011 the boys gave a monumental performance on the patio of Beerland for many hundred streetwalkers from all over the world, later reviewed twice by NME online. September 2011 marked the release their first full length ‘The One and Only’ on Tic Tac Totally records which has been lauded as the great return of rock’n‘roll and so on. OBN III’s first tour in Summer 2012 furthered the listening public’s suspicion that these are in fact the new gods. October, 30 2012 marks the release of their latest full length LP in stores near you. See them, hear them, feel them when they hit the road again in early 2013. This entry was posted on April 10, 2013 at 2:00 pm, filed under News and tagged bad sports, bryan street, obn iiis, strange boys.